Your back pain has plagued your life long enough. 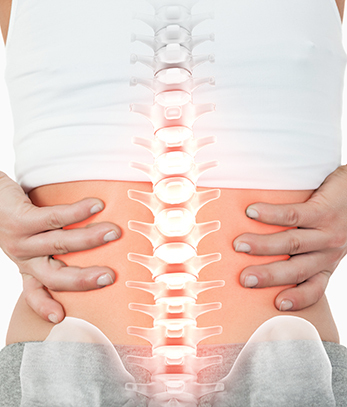 Don’t suffer for another day, explore your options with spinal decompression today. Chronic back pain has a constant impact on your work and the activities you love. If over the counter and prescription pain medications have failed to bring you the results you deserve, spinal decompression may be the treatment you need to achieve real chronic back pain relief. We demand a lot from our spine each day. With every bend, lift, stretch and twist we put wear and tear of the bones and nerves in our back that can begin to take a toll on the overall health of our spine. Even though our spine is designed to sustain constant use and the impact of our weight, it may need assistance to remain strong and healthy. Damage to the nerves, bones, and discs cushioning each of our vertebrae can result in severe pain radiating from our spine all over our bodies affecting the neck, limbs, fingers, and toes. Prolonged damage can put our mobility and nerves at significant risk of permanent damage. Spinal decompression works to relieve the pressure our daily activity places on the bones and discs that make up our spine and normalize their alignment. Relieving pressure with spinal decompression can eliminate stress on nerves to reduce pain, tingling, and numbness in the extremities and return strength and stability. Spinal decompression is a drug-free, non-invasive treatment option that supports your spine naturally while improving mobility and balance. This treatment requires no downtime or recovery and works for many patients looking to reduce their exposure to over-the-counter and prescription pain medications and NSAIDs. Spinal Decompression: What to Expect? The first step for any new patient in our office is a free consultation to understand your condition and personal health goals. Our specialists will discuss all the treatment options available to you for your condition and devise a plan to use spinal decompression to relieve your symptoms. spine and reduces stress on your nerves and discs while keeping you in control to stop the procedure immediately should you feel any discomfort. Our state-of-the-art spinal decompression technology tracks your body’s response to the lengthening in real time to automatically adjust the pressure and intensity to reduce any risk of pain or discomfort. Spinal decompression also helps relieve muscle tension and reduce inflammation in your spine. Each spinal decompression plan is tailored specifically to the unique needs of each of our patients. Our skilled specialists will devise a plan that works best with your schedule and comfort to meet your health goals. You don’t have to live with chronic back pain or ineffective treatments. Start feeling better today by calling to schedule your free spinal decompression consultation. Your non-invasive, drug-free treatment option is here to stop your pain and return the quality of life you deserve. Call us now to reserve your appointment and experience life without chronic back pain.